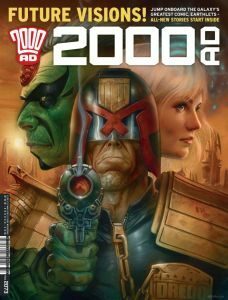 You are here: Home » MEDIA » Comics » 2000AD Prog 2073 (e-mag review). Here’s a special extra large edition of ‘’2000AD’ that costs an extra pound. But it’s worth it and with all new stories starting up, albeit with old characters, this would be a good time to ‘jump onboard the galaxy’s greatest comic, Earthlets’ as the cover blurb rightly states. First up is Judge Dredd with a popular theme: who judges the judges? A body called the SJS it turns out and in part one of ‘Fit For Purpose’ they summon Dredd as a witness because Judge Gerhart’s fitness for duty is being called into question. There’s flying skateboard action, too. Script by Rob Williams and attractive art by Chris Weston. Jaegir is new to me but, judging by part one of ‘In The Realm Of Pyrrhus’, it’s an all-action space opera strip. The opening dialogue is about the target being in a black hole distortion, sensor-blind with shields down, a line right out of ‘Star Trek’. Klaur is a brave Nordlander whose happy to be back on Nu-Earth killing Southers. Gordon Rennie’s script will presumably get more complex as it progresses and meanwhile the art of Simon Colby, heavily influenced by Neal Adams, makes it worth a look. More attractive pictures, this time in black and white, from Dylan Teague in ‘Future Shock: Freedom Wears Two Faces’. James Peaty’s script is about a digital heaven called The Eldorado Tesseract. The usual twist in the tale but nice minor details, like Dube for a morally dubious person. ‘2000AD’ is an action-orientated comic so this week’s Sinister Dexter episode ‘The Salad Of Bad Cafe’ was a real surprise. Sinister and Dexter sit in a cafe waiting to do a hit on someone called Beremy Bolgus. The graphics consist mostly of nine panels per page with a stationary camera shot of the two assassins at a table talking rubbish. The clever script by Dan Abnett is clearly a homage to ‘Pulp Fiction’ and Steve Yeowell somehow gets movement into the static situation. The strip was an intriguing change of pace and I loved it. One of the best ‘2000AD’ stories I ever read was an episode of ‘Anderson: Psi Division’ involving a whale, ‘Leviathan’s Farewell’ which is collected in ‘Judge Anderson: The Psi Files: Volume 1’. In many ways, her character is more interesting than Dredd, bless him, and she’s prettier, too. In ‘Undertow’: (part one) she begins an exciting new adventure when dangerous visions are spreading from Psi to Psi like a contagion. I look forward to reading more. Mega-City One is also the setting for a one-off story ‘Judge Fear: Memories Are Made Of This’ in which he uses Dean Martin clones to attack Earth. Not really. Actually, the clever chaps in charge have him imprisoned in a research facility and are investigating his potential as a weapon, against Dredd’s advice. They regret it. Last is ‘Strontium Dog: The Son’ (part one). The Search/Destroy Agency is back in business bounty hunting with a script by John Wagner and art by Carlos Ezquerra, a vintage team. At the Doghouse, where they gather, Johnny Alpha runs into one Kenton Sternhammer who says he’s the son of his old comrade Wulf and when rookies are matched with old hands, they’re teamed up for a job. What happens next? You’ll have to tune into 2000AD Prog # 2074 to find out. The last issue seemed to have too much mindless violence but that was probably because all the stories were ending and at the final big battle stage. These are all part one of new stories and some are surprisingly talky, which is no bad thing. You can bluff your way through with explosions and visual dynamics on the big screen but intelligent comic fans want a story, too. I was surprised at the extra pound cost. I didn’t know about the extra pages until after I bought it, but on investigation found that one can get a month’s digital subscription for just £7.99 which keeps it at the old price. « The Mission (A New Earth Novella) by MJ McGriff (book review).